Timing is everything for a successful release. 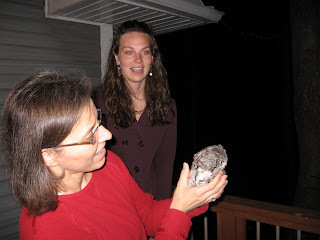 For this Eastern Screech Owl his release was a long time coming! He came into REGI in June of 2008 still covered in some juvenile gray fuzz. When he first arrived he captured every summer intern’s heart with is small size and awkward appearance. He came to us with an injured wing, perhaps resulting from a first flight gone wrong. We carefully set his wing and kept a close eye on him. It didn’t take us long to see this bird had a strong personality and he didn’t want anyone to forget that he was NOT happy about his current situation and would like to leave us as soon as possible. The annoyed look on his face only became fiercer if we made any comments on his “cute” appearance. Don’t let his small size fool you: this screech owl was one tough raptor! All summer we nursed him back to health. He just needed time to heal his wing and grow up a little. When September came he was zipping around the flight cage and was at a good weight. We started to talk about when and where he should be released. Screech owls migrate slightly south during the Wisconsin winters and we knew he needed to be on his way soon. We decided that he would be released in early October near Milwaukee. The week before his set release date we started to notice some scraggly feather. A few days later he had decided to go into a full molt! When we release a bird they need to be in perfect condition and he had feathers sticking out every which way. Sigh. This was not his time. Even though he was finished molting near the end of November we had to over winter him at REGI. Winter takes forever in my mind. I can’t image what a long winter it was for this spirited screech owl. Finally, in March spring started to arrive in Wisconsin. 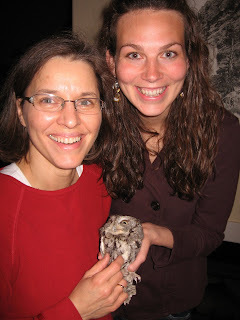 Once again we started to talk about when and where to release our feisty little screech owl. The weather was becoming better but this little screech had never hunted on his own. We were concerned with no other food alternatives beside small rodents this early in the season of his success rate. We wanted to make sure his transition back to the wild would go smoothly. A little more time was needed for the insects to return, which is another food source for screech owls. “Happy May Day!” I told the little screech owl as he bit the towel I was picking him up with “Your time has finally come.” I drove him down to Stevens Point and under the safety of the night Jean Rice and I watched him fly away from her back deck into the nearby oaks. The REGI staff had done all we could. It was time for him to take that attitude and put it to some good use for hunting or finding a mate.